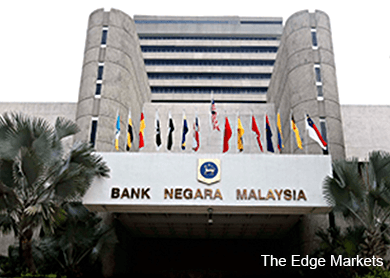 KUALA LUMPUR (Feb 13): Bank Negara Malaysia is expected to maintain interest rates at the current level till 2016 as economic growth risk increases amid slowing inflation, according to Deutsche Bank. In a note, Deutsche Bank said with growth risk rising, the probability of Bank Negara raising the overnight policy rate (OPR) in 2015 had "diminished considerably". "Indeed, we think that an unchanged policy rate path is ahead through the course of 2015 and 2016. One risk to the policy rate outlook is however the state of the currency. The ringgit’s 9.2% slide against the USD since last June has been striking, the worst in EM Asia. "If the currency’s slide and portfolio outflows become disorderly, Bank Negara may well have to raise rates to defend the currency and restrain import demand. We however see this as no more than a tail risk scenario," Deutsche Bank said. The ringgit was traded at 3.5760 versus the US dollar at 1:24pm today. This compared to 3.1415 in August 2014. In January 2015, Bank Negara had at its latest monetary policy committee meeting kept the OPR at 3.25%. Yesterday, the central bank said the country's gross domestic product (GDP) rose 5.8% in the fourth quarter of 2014 from a year earlier. Full-year GDP growth came in at 6%. Earlier, the Statistics Department said the country's inflation, as measured by the consumer price index, rose 3.2% from a year earlier. Today, Deutsche Bank said it expected Malaysia's real GDP growth to come in at 4.5% in 2015 while inflation was seen at 2.9% by year end. Deutsche Bank said the goods and services tax starting this April 1, would have a more muted impact on inflation due to declining energy prices and demand. "The combination of a worsening growth outlook and high debt is a dangerous one, and perhaps is the key concern among investors at the current juncture. A recovery in oil price would reduce but not eliminate this risk. "Sooner or later, Malaysia’s high-debt levels would have to be dealt with by the authorities, and it has to be done before the debt burden becomes a constraint on economic activities," Deutsche Bank.